I sooo need some flying monkeys in my life!TIA. I recently installed a wicker basket on the front of my bike and was thinking about decorating it. 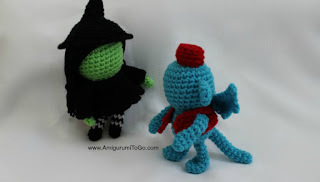 Because it reminds me of the wicked witch bike (or rather the mean ole lady that threatened Toto), I'm now thinking maybe I'll make some flying monkeys and attach them. I can't wait to see the pattern! It looks like fun, and I'm sure the instructions are fantastic, just like all your patterns are! awww, that sounds like a great idea, how fun!